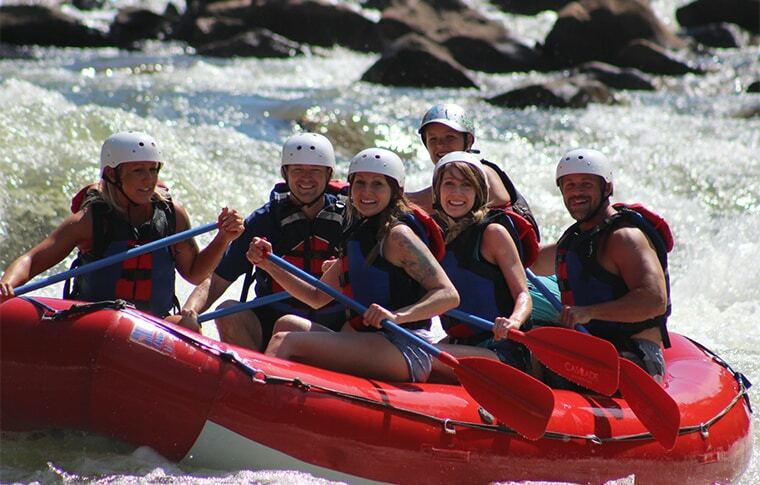 If you’re a thrill seeker looking for a truly original rafting experience, our full day tour is for you. Join us on a ten mile rafting trip that gives you the chance to take on the 1996 Olympic whitewater slalom competition course. A once-in-a-lifetime adventure! Every weekend June through August • Saturdays only in May & September. Please see booking system for more information. Trip Launch Time: 10:30am sharp. Please don’t forget we’re on Eastern Time! Put In At: Ocoee Dam Number 3. Take Out At: Just below Ocoee Number 2 Powerhouse. Ample secure & free parking available. Please click for more location details and map. Group Size: We can accommodate any group size. Maximum raft size is 6 people plus an experienced guide. Solo visitors welcome. You will be paired with other like-minded rafters for the trip. Included: Raft • Life Jacket • Helmet • Paddle • Spray Jacket • Transportation to River. Not Included: Gratuities • Photographs • For more information please see our FAQ’s page. Participation Requirements: Max Weight 265-275 Ibs • Relatively Good Health • Competent Swimmer. Suitable for whitewater beginners and more advanced rafters. Minimum Age: Children must be at least 12 years old by Tennessee State Law. What to Wear: Bathing Suit/Shorts (no bikinis!) • T-shirt • Fleece Clothing • Old Sports Shoes (not flip flops) • For more information please see our FAQ’s page. What to Bring: Waterproof Sun Protection • Dry Clothes • Towel • Shower Supplies • Inhalers • Sunglass Retainers • Plastic Bag • Water • For more information please see our FAQ’s page. Special Dietary Requirements: Vegetarian options available. For any other requirements please call ahead. Double your rafting fun by taking on our full-day adventure experience. As well as the exciting five miles of whitewater on the half-day tour, join us in taking on the Olympic course. This course was previously tackled by competitors in the 1996 Atlanta Summer Olympics. 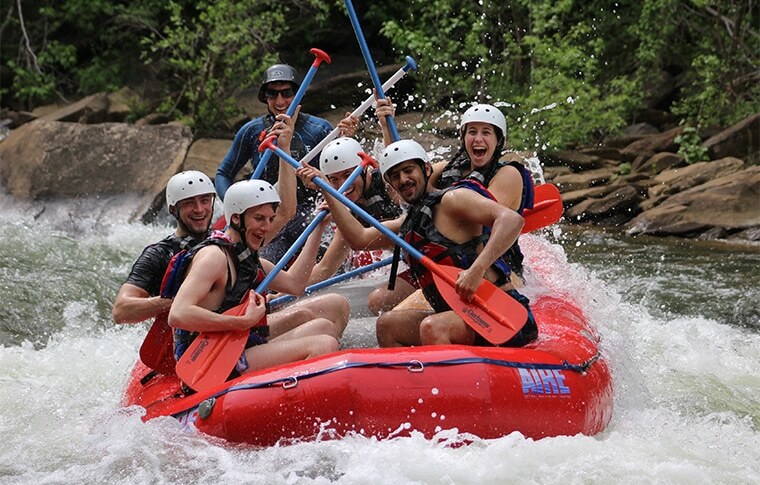 This section of the river offers one of the most exciting rides in the Ocoee River, highlighted by the last two rapids Godzilla and Humongous which you’ll tackle back to back. Expect classic drops and big water rapids. Our highly trained guides will be with you every step of the way. Perfect for the more adventurous rafter! After meeting and getting all the Waivers signed we’ll board the bus for the short journey to our start location. Next our experienced guides will deliver a full safety briefing. You’ll get all your rafting gear and have a chance to ask any questions you might have. Our start point offers stunning scenery and a real sense of being in the wilderness. 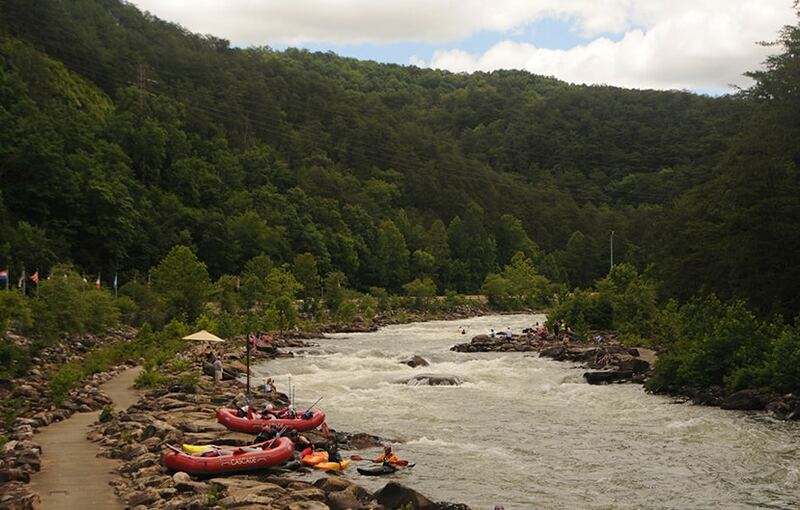 You won’t find too many other rafters here so you’ll have chance to take in the beautiful Cherokee National Forest. Don’t forget to keep your eyes out for bald eagles, black bears and wild pigs. We’ll begin with some gentle Class II rapids giving you a chance to build your team strategy for the more challenging rapids ahead! Once you’ve worked your way through some of the smaller rapids, your guide will lead you on to tackle the most intense stretch of whitewater! We’ll hit half a dozen Class III and IV rapids including Best Ledge, Callihan’s Ledge and Edge of the World. Through these rapids, your expert guide will be there to help and make sure you’re having a great time! We’ll take a well earned break to fuel up under our riverside pavilion. Fill up on our freshly prepared buffet style lunch. Expect to tuck into a delicious homemade lunch with all the trimmings. Whilst you lunch, you’ll be able to watch other rafters taking on the mighty Godzilla and Humongous! THE FUN’S NOT OVER YET! After we’ve refuelled, it’s time to hit the final section of the course. 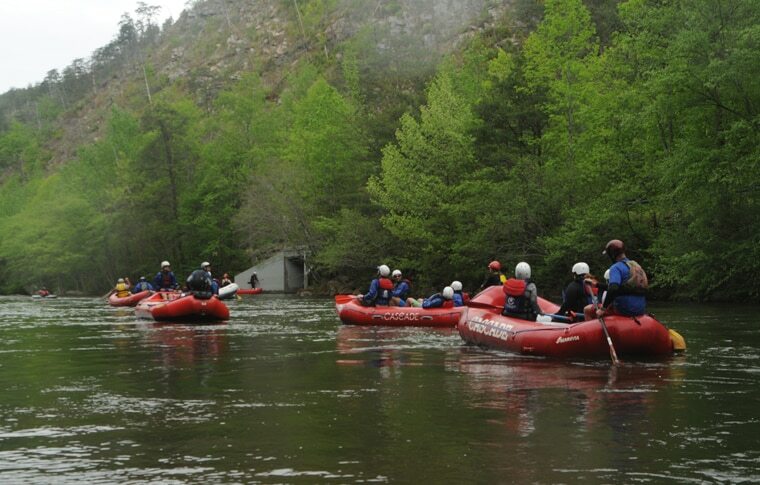 The middle river section will take you through the beautiful Ocoee River Gorge. We’ll tackle Moonshot which has the best spins on the course as well as Flipper, a classic Ocoee playspot. As you raft your way down you’ll become more confident working as a team and more skilled at paddling through the rapids. Once you’ve tackled all the rapids and have taken in all the picturesque wildlife and beautiful scenery we’ll get you back onto land. Our transport will be on hand to take you back to the Outpost. Here, we have hot showers for you to freshen up and you’ll be able to see the professional photos of your Cascade Outdoors trip. Your safety is our number one priority. We pride ourselves on having the best, expertly trained guides on the river to ensure you feel prepared and secure on the water. • All our guides have been personally scouted by Kip who has over 20 years rafting experience and has even competed in World Championships! • Cascade Outdoors’ guides have all completed a state-approved Advanced First Aid, CPR & Wilderness First Responder training course. • During your safety briefing our guides will cover important aspects of rafting including how to stay in the raft, paddle strokes and commands and what to do if you fall out the raft. • Our guides are passionate about rafting and will be happy to customise your trip should you want to take on more challenges or take it a little bit easier. • All our guides have had experience on whitewater since at least 2011 and have tackled rivers all over the world. 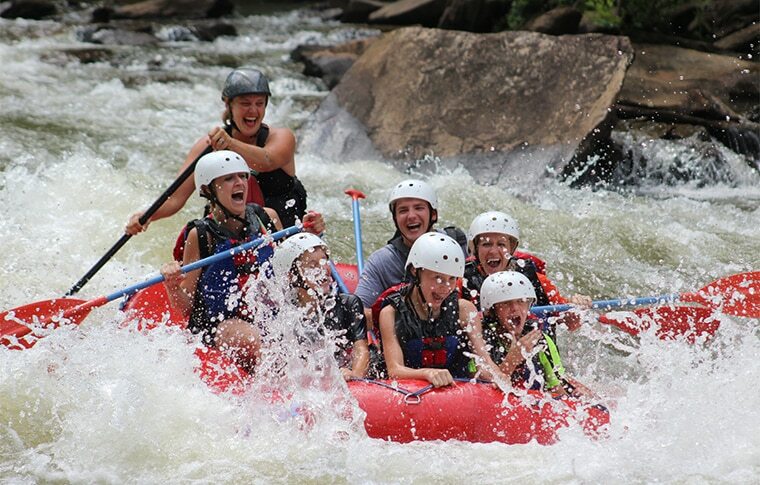 They will always be prepared for whatever the Ocoee River or the weather may throw at us! • Requests for specific guides are welcome. We will do our best to accommodate these where possible. Learn more about our guides here. Eddie our guide was great, very interactive with our group, safe but very adventuresome as well. The lunch at mid-way was very good, did not expect such a spread. We will be bringing the whole family back next year. We have been twice and we're lucky enough to get Beth Ann as a raft guide both times!! I highly recommend using Cascade! Smaller company means more fun!!! The entire team is fantastic and very knowledgeable about the river. Our guide got us to some "sweet spots" and we felt safe the entire time. This is our second time using Cascade for our rafting trip and we will continue to use their services.